While UV-C is a proven germicide, numerous barriers exist to effectively implement and benefit from this technology cost-efficiently and without disrupting facility operations. 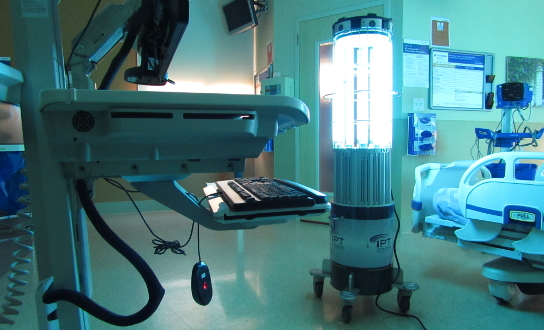 As a result, numerous facilities have deemed ultraviolet light and other advanced disinfection technologies costly and ineffective in lowering hospital acquired infections. The CSGI System is a collection of processes and technologies to maximize and monitor the impact of UV-C room and portable equipment disinfection. The CSGI System has been continually refined through multiple clinical trials, nearly 100,000 CSGI disinfections, and years of hands on experience with UV-C devices. Direct Service Model: CSGI provides 24/7 specialized UV operators, UV emitters, infection prevention education, logistics, reporting and accountability systems. The direct service model eliminates the burden of implementation for clients. In addition to onsite technicians, we offer mobile UV-C disinfection for outpatient clinics and nursing homes. Learn more here. Managed Service Model: CSGI's Automated Management Platform (CSGI AMP) is the only universal UV management software to optimize your UV disinfection intervention. CSGI AMP maximizes the value of UV interventions for hospitals by eliminating bottom-line inefficiencies and increasing HAI risk reduction. UV Disinfection Technology Sales and Distribution: CSGI provides no-touch technology, operator training, and ongoing program support. Showing a return on investment ranging from hundreds of thousands to millions of dollars after implementing CSGI protocols and software support. Reducing the cost of implementing advanced technology by using fewer devices and operators to disinfect more high value locations. 30 day contractual out clause for lack of proven performance.